Squirrels are fascinating critters to watch until they start destroying your yard and invading your home. Squirrels can dig burrows, eat produce in your garden and chew through electrical wires. Learn how to get rid of squirrels naturally or without killing them. Squirrels can destroy your home, yard and peace of mind. Remove all sources of food and water from your yard. 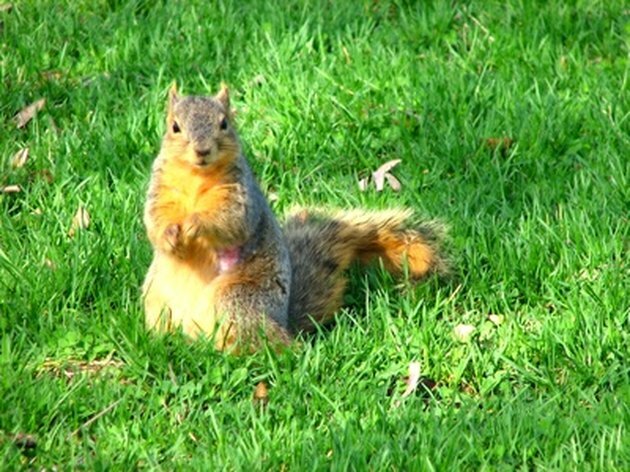 Squirrels are attracted to environments that offer easy access to food and water. If you have a bird feeder in your yard, change the feeder to a squirrel-proof bird feeder. You can purchase squirrel-proof bird feeders at pet and gardening stores. Place live traps in areas where squirrels are most active. Rex E. Marsh of the University of California recommends baiting the traps with walnuts, almonds, slices of orange or pieces of melon. Check the live traps at dawn and dusk when squirrels are most active. Release the captured squirrels at least 1 mile away from your property. You can purchase live traps at hardware stores. Use natural squirrel repellents, like chili peppers to get rid of curious squirrels. Dice the chili peppers and place them in a spray bottle. Add water and shake well. Spray the repellent around your home and in your garden. Re-spray after every rainy day to ensure lasting success. Seal any openings in your attic, basement, crawlspace or elsewhere with caulking or steel mesh wire to prevent squirrels from inhabiting your home. You can purchase caulk and steel mesh wire at hardware stores.